The Forbidden Kingdom is a delightful, fun, light hearted wuxia fantasy tale. Although I absolutely loved the more serious wuxia films of late it was refreshing to sit down to a light hearted one. The use and references to Chinese and Wuxia characters was really neat. I found it fun to test my geek knowledge by trying to guess who was who before they were introduced and proud to say that I got them right. The fight sequences were beautiful and well choreographed but at times lacked the ferocity and intensity of the martial style. The visuals were beautiful especially the cherry blossom field. 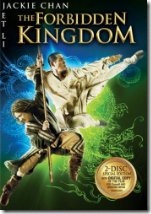 Forbidden Kingdom is about a kung fu obsessed American teen who discovers a staff. The discovery sends him on an adventure to China, where he joins up with a band of martial arts warriors in order to free the imprisoned Monkey King. There is a lot of wirework and graceful movements to the point that the feel of raw grit and intensity of martial fighting is lost in some of the fight sequences. Aka, some fights were all silk and no steel. Wire work not well done and drew attention to fact it was wirework. Older PostCostume: Don't Blink Jewel!